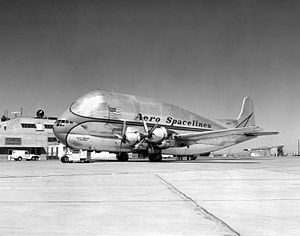 The Aero Spacelines Pregnant Guppy was a large, wide-bodied cargo aircraft built in the United States and used for ferrying outsized cargo items, most notably NASA's components of the Apollo program. The Pregnant Guppy was the first of the Guppy line of aircraft produced by Aero Spacelines. The design also inspired similar designs such as the jet-powered Airbus Beluga, and the Boeing Dreamlifter. In 1960, U.S. airlines were disposing of their obsolete piston-engined Boeing 377 Stratocruisers in favor of the newer jet-engined airliners. NASA was finding that barge transport of their increasingly large space program components from manufacturers on the West Coast to test and launch sites on the East Coast was slow and expensive. Aircraft broker Leo Mansdorf was stockpiling surplus Stratocruisers at Van Nuys prior to resale, and ex-USAF pilot John M. Conroy realized the potential of these aircraft to transport the large but relatively light rocket components. Conroy presented his plans for an extensively modified Stratocruiser to NASA, where an official commented that the bloated aircraft resembled a pregnant guppy. Although NASA was lukewarm on the concept, Conroy mortgaged his house and founded Aero Spacelines International in order to build and operate the concept aircraft. Conversion work was undertaken by On Mark Engineering. The Pregnant Guppy (registered N1024V) was built from an ex-Pan Am airframe with a five-meter section from an ex-British Overseas Airways Corporation aircraft (G-AKGJ) added immediately behind the wing. The wing, engines, tail, nose and cockpit were unchanged, but a new upper fuselage of six meters diameter was added, giving the aircraft a "triple-bubble" appearance in front view. The entire rear section (including tail surfaces) was detachable to allow cargo to be loaded directly into the fuselage. The aircraft first flew on September 19, 1962, piloted by Conroy and co-pilot Clay Lacy. When Van Nuys traffic control realized that Conroy intended to take off, they notified police and fire departments to be on alert. However the huge aircraft performed flawlessly, the only difference in handling being a slight decrease in speed caused by extra drag of the larger fuselage. Carrying the S-IV Saturn I rocket stage, the Guppy saved three weeks transit time versus barge, for a cost of $16.00 (equivalent to $129.25 today) per mile (1.6 km). In summer 1963, the Pregnant Guppy began flying NASA cargo. Among its early duties was transporting the first and second stages of the Gemini program's Titan II from the Martin Co. in Baltimore, Maryland to Cape Canaveral. As the space program grew through the late 1960s, it became clear that this one aircraft could not handle the whole transport load, and so 25 more Stratocruisers and ex-USAF C-97s were purchased to construct four Super Guppy aircraft, which were even longer and larger than the original. The various Guppy aircraft served throughout the 1960s, 1970s, and beyond, initially transporting space components, and later, as NASA scaled down its operations after the success of the Apollo program, transporting airliner sections. The Pregnant Guppy was sold to American Jet Industries and registered N126AJ. It was broken up at Van Nuys in 1979. ^ Bilstein, Roger E. (1996). Stages to Saturn: A Technological History of the Apollo/Saturn Launch Vehicles. The NASA History Series. National Aeronautics and Space Administration, NASA History Office. pp. 313–319. SP-4206. Archived from the original on 2004-10-15. Retrieved 2010-05-03. ^ "Saturn Transportation Equipment". Stages to Saturn. NASA. Retrieved 2014-01-20. Wikimedia Commons has media related to Aero Spacelines Pregnant Guppy. "Model 377 Stratocruiser Commercial Transport" by Boeing. Retrieved October 5, 2006. "All About Guppys", by Daren Savage. Updated September 17, 2006. Retrieved October 5, 2006. "Boeing 377 Pregnant Guppy" by Kenneth W. Shanaberger. Updated August 31, 2004. Retrieved October 5, 2006. "The Plane That Won The Space Race" by Margy Bloom. Retrieved May/June 2010.